I used to think that confidence would come when I could get everything to go right, and get myself to do everything perfectly. And of course I never could, so my confidence would come and go. 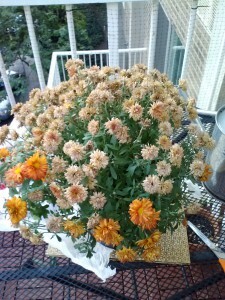 Then I learned something from my dying Fall mum plant. 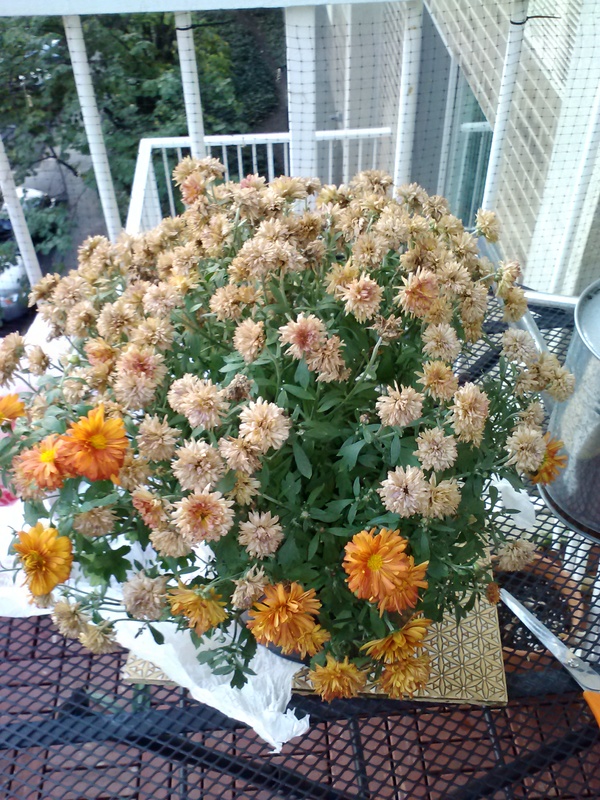 I’ve often described myself as having a brown thumb; plants often die in my “care.” But I still keep trying, and my latest, gorgeous burnt orange mum was making me smile every time I looked out onto my balcony. 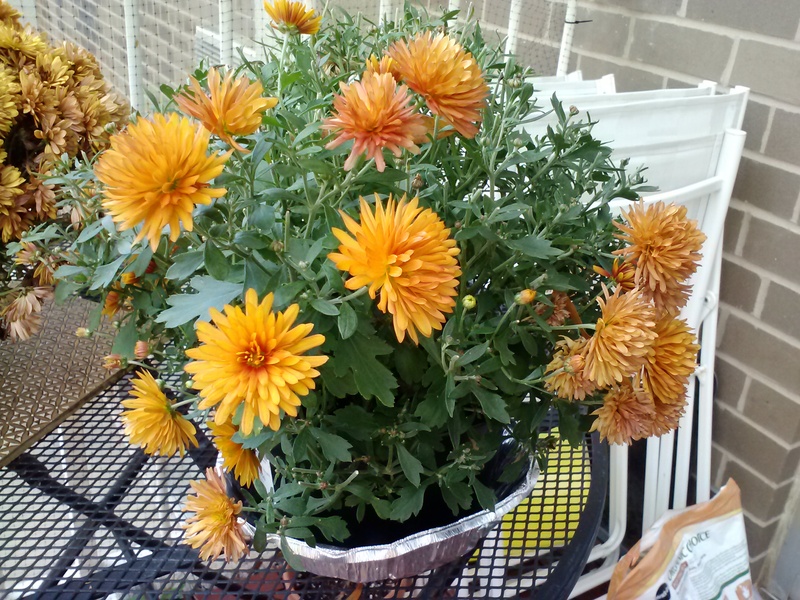 Then I went away for one, unusually warm weekend, after a very busy non-watering week, and I when I returned, the plant was….well you can see, mostly dried blossoms. So I put down some newspaper and got out my kitchen scissors, and sat down at my balcony table. And one by one (with a level of patience and quietude that I don’t often experience) I cut off each of the dried blossoms, leaving only a very few burnt orange ones, and lots of cut stems. And a few buds that still held promise. I don’t know why exactly, but something about this process made me get out the old bottle of plant food drops that I never used. I added some to the water, and promised to keep the soil moist. Which I’ve managed to do. 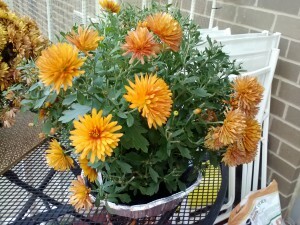 Today, I count about 22 blossoms, scattered enough through the plant so that it makes me smile every time I look at it. This time, I got it right. So what did I learn from my sweet mum? (that quite honestly I didn’t learn from my own mom, who didn’t know how to do this for herself or her children)? That my confidence in myself doesn’t depend on getting it right all the time. Rather I can be confident that when I do get something wrong, and I will, there are steps I can take, and I will take them. Look at the results of “getting it wrong, ” let go of judgement, decided to do what I can to fix it, do the best that I can, and let go of the outcome, trusting in the Life Force that is bigger than my mistakes. I’m going to try this again! That’s certainly a valuable message, Terry. I also believe that you looked at the plant with a different level of awareness…not just the quick and easy solution that left you sad and unsatisfied, but a closer, slower look at the life that was there. You matched that with the desire to become involved in a process that you hadn’t yet tried, to get a more desirable result. Talk about a metaphor for life’s challenges!